The population of Zaporozhye is about 1 million people. 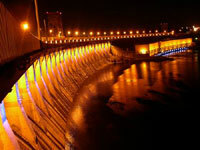 It is situated in the south of Ukraine on the bank of the river Dnieper . Zaporozhye is a large industrial, scientific and cultural center. It has 8 higher educational institutions and many colleges. It is a center of metallurgical industry, a center of production of aircraft engines, a center of instrument-making industry. Zaporozhye region is located in the maritime - steppe zone, summer is hot (an average temperature - +20,7 0 - +23.6 0 ), winter is mild (an average temperature - -4 0 ). The climate of the Azov sea-side where a sport-health resort is situated has its unique peculiarities: the air of sea harmonized well with the air of stepper. There are sunny days the whole year round. 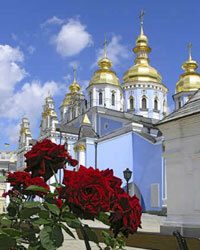 Ukraine is the second largest country in Europe with the territory of 603,700 sq.km. Its population is 50 million people. 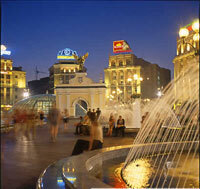 The capital and the largest city of Ukraine is Kiev. The neighboring countries of Ukraine are: Belarus, Russia, Slovakia, Hungary, Romania, Moldova and Poland . To the South Ukraine is washed with Black Sea and Sea of Azov. The country has the sea boarders with Turkey, Bulgaria and Georgia. The neighboring countries of Ukraine are: Belarus, Russia, Slovakia, Hungary, Romania, Moldova and Poland . To the South Ukraine is washed with Black Sea and Sea of Azov. The country has the sea boarders with Turkey, Bulgaria and Georgia. Ukraine is a state with the democratic form of governing, headed by the nation-wide elected president. The verkhovna Rada (the Ukranian parliament) is the highest legislative body. It consists of 450 members, elected for 4-term in accordance with the proportional majority system. On August 24, 1991 Ukraine declared itself an independent state. In an effort to rebuild the country of Ukraine has opened her doors to foreign investors, businessmen, and foremost to tourists. The richly talented Ukrainian people have created wonderful architecture, many monuments both secular and religious, dating from 11th to 18th centuries can be seen in all throughout Ukraine towns and cities. If you get a chance, visit some of the many historic sites and towns, where numerous treasures will tell you of the great past and traditions. The past is reflected in the architecture and atmosphere of cities. Ukraine has a well-developed economy with considerable portions of agricultural and industrial sectors. Space and rocket engineering, aircraft and ship building, high tech equipment production are among the main branches of the Ukrainian industry. Cultural life of national minorities in Ukraine - Bulgarian, Greek, Jewish, Crimean Tartar, German, Polish, Russian, Romanian, Hungarian and dozens of others - is very diversified. A system of national schools, libraries, mass media, scientific centers, radio and television, theatres and creative societies is being developed. Languages of all peoples inhabiting the territory of Ukraine are granted equality on the state level. Today Ukraine is an internationally oriented center of high technology, with speech technology, micro electronics, chips development, media technology and genetic engineering as out standing examples. Thanks to international communications and transport systems it is literally the hub of central Europe. Ukraine has always paid great attention to the United Nations activity in promotion and protection of human rights. The Ukrainian constitution also guarantees the right of every person to appeal to relevant international institutions and organizations for protection of his or her rights. Ukrainians openness, accessibility and efficiency are more than just empty words. Higher Education for Foreign students: As a foreign student you will discover a region full of surprising contrasts. You will find yourself quickly becoming part of it, especially during the many festivals and the intense cultural life, for which the region is famous. Getting between major Ukrainian cities is best done by train and also by flight. They are frequent , cheap and often convenient journey. There are bus services to most cities and towns. Taxi services are numerous in Ukraine. Fines are imposed if traffic police smell alcohol in a driver's breath. Driving Speed limits are 40 kph in built-up areas, 90 kph in countryside and 110kph on the motorways. For foreigners an international driving license is required to drive automobiles in Ukraine.